The Kershaw Blackout knives have become my most used knives for backpacking. They look quite Black-Ops with their Diamond Like Carbon coating. While they have a comfortable full-handed feel to them they are actually quite light. They have taken some heavy-handed abuse from me and handled it with aplomb. Please read on for the details. The Kershaw Blackout and Blackout Serrated (hereafter referred to as the Blackouts or knives) are some of the highest rated and most popular knives the company has made. The Blackouts feature a drop-point blade made of high-performance 14C28N steel, a type that was developed in a partnership between Kershaw and Sandvik Steel. While this blend is said to offer excellent corrosion resistance, hardness, and edge retention, Kershaw bumped up the performance by adding a tungsten DLC (Diamond Like Carbon) coating, giving it a blacked-out look. Oh yeah, and giving it a reason for the name. While the standard has a full straight blade, the Serrated has a partially-serrated blade to give it more performance for cutting things like rope and cord. As may be seen above, the serrations occupy just over the first one-third of the blade. 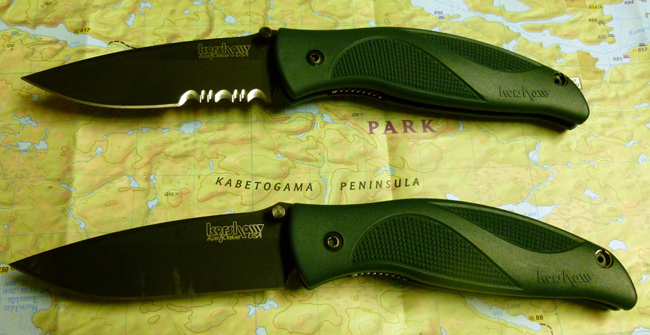 The knives have green glass-filled nylon handles. While not as high-tech as some of my other Kershaw knives these really fit my large hands well, giving me a feeling of security when using them. The knurling on the handles keeps the nylon from getting too slick with wet or sweaty hands. 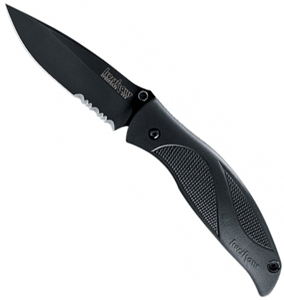 Like my other Kershaw knives the Blackout uses the company's patented, assisted-opening system, SpeedSafe. It assists the user to smoothly open the knife with a manual push on the blade's thumb stud. The thumb stud comes set up for right-handed use, but with a tiny screwdriver it may be switched to the other side of the blade to accommodate left-handed users. As I am a righty I am good as it is. As I do not know the actual physics/mechanics of the knife I quote Kershaw; "The heart of the SpeedSafe system is its torsion bar. Closed, the torsion bar helps keep the knife closed, preventing it from being opened by 'gravity'. In order to open the knife, the user must apply manual pressure to the thumb stud to overcome the resistance of the torsion bar. After the blade is out of the handle, the torsion bar moves along its half-moon track and takes over. The blade opens smoothly and locks into position, ready for use." The Blackouts do open quick and smoothly. Once open the blades stay in place with a liner locking feature. With a liner lock one side of the liner (the steel plates to which the handles are attached and the blade sits between when closed) slides over to block the blade from rotating back downward. To unlock the blade the user pushes sideways on the curved, ridged area on the liner. This pushes it away from the blade letting it drop once more into the liners. There is no way to realistically list all of the places these knives have been to over the years. The serrated has been on about 50% of all my California hikes that I either used a pack that would not allow me to use the hanging knife I normally carry there (Gerber Guardian, see review), or in winter when I prefer a folder with me. This means that it saw a lot of high elevation backpacking, much of it in the Sierra Nevada range. Elevations would have been from 5,000' to over 14,000' (1500 to 4300 m) in temps from 10 to over 100 F (-21 to 38 C). In Minnesota the regular blade has been all over the northern half of the state from Lake Bronson State Park on the west side near Canada (where it is seen above clipped to my pocket as I cross Two Rivers), to Judge C.R. Magney State Park on the far east side, also near the Canadian border. These low elevation trips never saw more than a 1000' (300 m) above sea level but they had lots of rain and high humidity. Winter trips here included nine days in Voyageurs National Park where temps got as low as -31 F (-35 C). I picked up my first Blackout in California because I knew the Kershaw name well as they are my second most purchased brand of outdoor knives, plus I saw it on sale so decided to give it a look. I really liked the feel of the grip, which is a big departure from the slim steel, titanium, and G10 laminates of my other Kershaws. While those may be ascetically more pleasing to the eye (or in the case of G10 tougher and more secure) the big nylon grips really felt good in my big paws. The regular straight-bladed G was my first purchase but when I saw the serrated GST a year later I bought it too, keeping it in California, and took the G to Minnesota. When wearing loose hiking pants and shorts the bulk of the Blackouts grips are not very noticeable, which combined with the good grip they provide made them quickly the folder I grabbed when I needed an extra, or different, knife. The serrated blade I like for two reasons. First, it is just cool to see the gut-tearing serrations flash as it opens. It gives me my Rambo moment for the day and at my age (and woman appeal) I will take any excitement I can get. ;-) Second, I still (and will always) remember my whitewater days and want a knife that can be deployed quickly and can go through rope fast! But as cool as the serrated Blackout GST is I have used the straight G much more. It cuts food much better and I spent a bunch of trips messing with some Cold Water meals (see reviews) that I added cheese and meat to. On a long PCT trip I had used a FoodSaver to package Cabot Seriously Sharp Cheddar Cheese as it will keep well. In camp I would chop it up and add it to my meals. The Blackout was great for this. It even chopped up Spam. 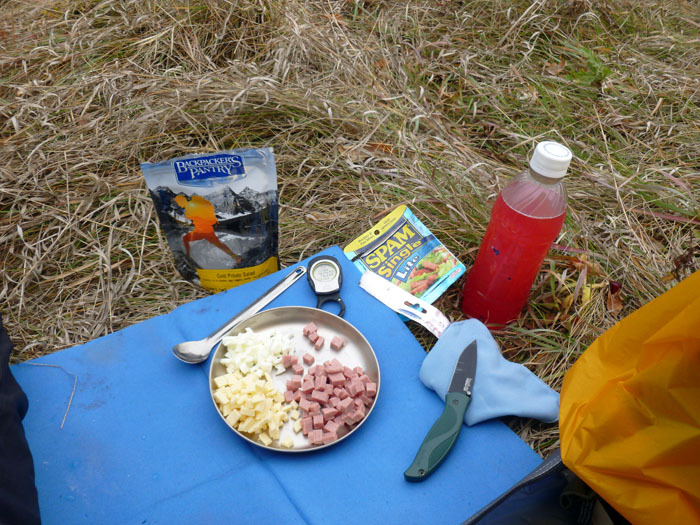 It was not as good as I thought it would be for a backpacking protein addition� In the pic below I just chopped Spam, cheese and a hardboiled egg to add to some potato salad. 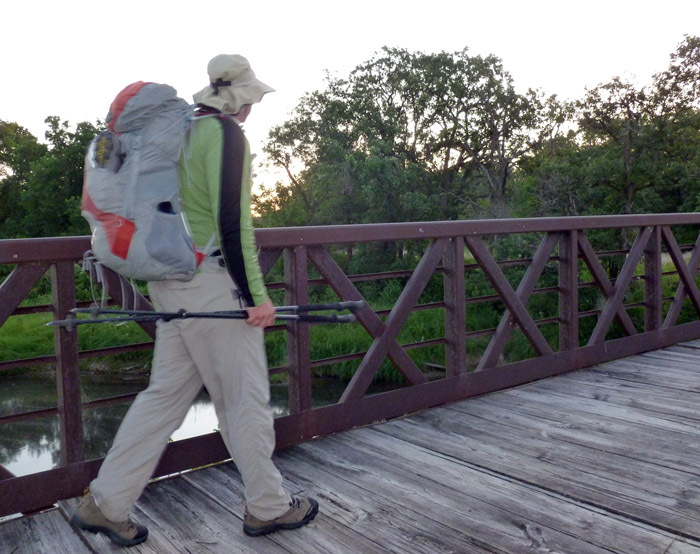 But the G got a lot of serious abuse from me on the backpacking trips I took with my children in Minnesota, and the trips I took while using and reviewing a wood burning backpacking cooking system, the Trail Designs Sidewinder. (See review.) The Blackout had to do a lot of wood shaving making tinder sticks for the stove use. But the trips with the kids saw the poor knife acting as Paul Bunyan's axe! Almost every backpacking site I have seen in Minnesota's State and National Parks and the ones on the big trails like Superior Hiking Trail, North Country Trail and Gunflint/Border Route have fire rings hauled into them and installed. While my solo hiking sees me still adhering to the campfire-less practices I developed in the mountains of California when hiking with my children the joy that a fire brings them made me often make one for them. But I never bring a hatchet. Blackout to the rescue! It is pretty amazing what I have done with this knife when I needed to split open wet wood to get to burnable material to get a fire going in this rainy place. My daughter would hold a chunk of wood as I positioned the blade and smacked it with a branch. Hmm, I hope Kershaw is not reading this. 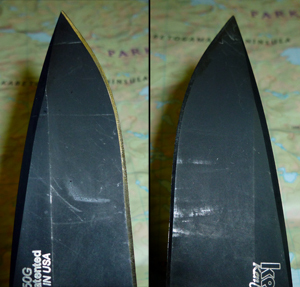 I may have voided the warranty� The picture of each side of the blade here shows what it looks like today. The DLC coating is understandably worn. I have never sharpened it, just run it over a steel a few times. It is still very sharp. The kind of use I have put the Blackout through should stress all of the structural elements of the knife but everything works well. The assisted opening is still smooth and fast and the liner locks holds it tight. The clip has proven to be quite strong itself. Another Kershaw knife of mine got bent (which a phone call inquiring into buying a replacement resulted in them sending me three replacements free, great customer service!) but these have weathered many miles and are still tight and secure. I have yet to find anything to complain about these fine knives. I really do think they may be the best bang-for-the-buck of the entire Kershaw line. It is enough to bring tears to my eyes. But Onions always do that to me� (Kershaw joke, buy some and you will get it.) I leave with a pic of a Blackout hanging from my pocket as Emma helps me filter water at Itasca State Park. This report was created with the BackpackGearTest.org Report Writer Version 1.5 Copyright 2013. All rights reserved.